I left my home near the Old Spitalfields Market early and walked East for an hour through Bethnal Green and Hackney Wick, as the dawn came up and the empty streets filled with people, until I reached the New Spitalfields Market where I had the honour of a breakfast with Jim Heppel, the Chief Executive of the Market Tenants’ Association, at seven. 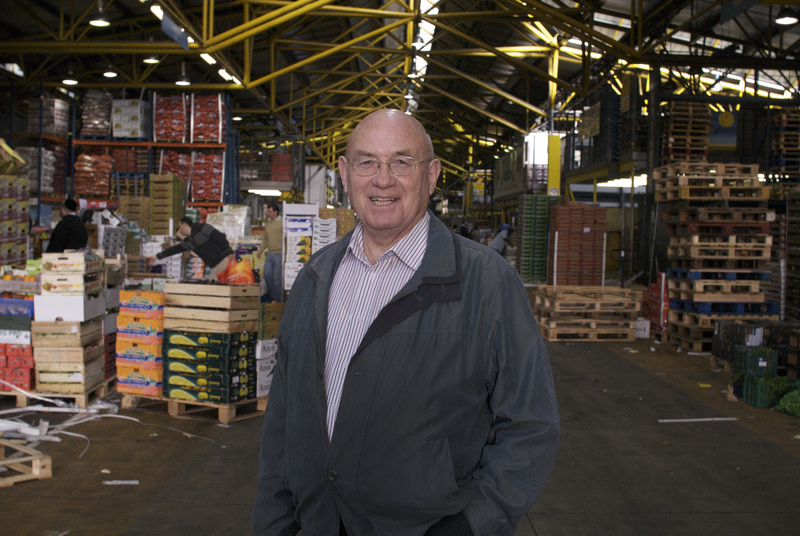 Jim joined the Spitalfields Market on 11th February 1983 and retires this week after twenty-seven years service that included masterminding the move to this new site on Walthamstow Marshes in 1991. In spite of the vast scale of the trading operation, as Jim stood grinning like a schoolboy to have his scarf tied round his neck by his secretary I realised the atmosphere in the Tenants’ Association office was closer to that of a small family business, with plenty of affectionately cherished quirks and idiosyncrasies displayed by the long time employees. Without a doubt, Jim is the least corporate executive I ever met. As we set out across the car park from the office towards the market structure that loomed in front of us, filling the field of vision entirely, I could see the trading aisles crisscrossed by a hundred fast-moving forklift trucks, receding into the far distance beneath the yellow vaulted steel roof. At the entrance, I was dazzled by the spectacle of armies of traders dealing more fruit and vegetables that I could dream of. Then, once we entered the trading area, people ceased their labours which were all-engaging the second before and came over to shake Jim’s hand in recognition of the unique role he has played in the history of the market. It was a touching sight to witness these men open up to Jim with exuberant smiles and to recognise that the market enjoys a vigorous life as a human community which is as vibrant as it ever was. But even more remarkable to me at first was the strange air of familiarity about the whole scene. The stacks of crates, the busy traders, the trashed boxes and spilled produce, even the scavengers scrabbling for stray tomatoes in the car park, I recognised all these from my memories of the old Spitalfields Market and Mark Jackson & Huw Davies’ photographs taken there in 1991. As we walked through the market, I found myself looking over my shoulder at the forklift trucks careering like dodgems in every direction but Jim walked with relaxed assurance, owning the space as if he were a ring master at the centre of his own personal circus, entirely unafraid of collisions with acrobats or stray elephants. He wanted to be photographed beneath the clock that was all they brought from the old market yet, as I was introduced to men who were six generation fruit and vegetable sellers, I realised the market itself is an enduring social organism that has greater longevity than the buildings and their fixtures. Back in Spitalfields, even nearly twenty years after the move, there remains a sense of absence that something which defined the place for centuries has gone. But the market has not disappeared, I am happy to report that like the island which sailed away it still exists and thrives. More than this, the island has grown to become a continent, because while the old market provided ten acres of trading there are now thirty-two acres, providing employment for fifteen hundred people. 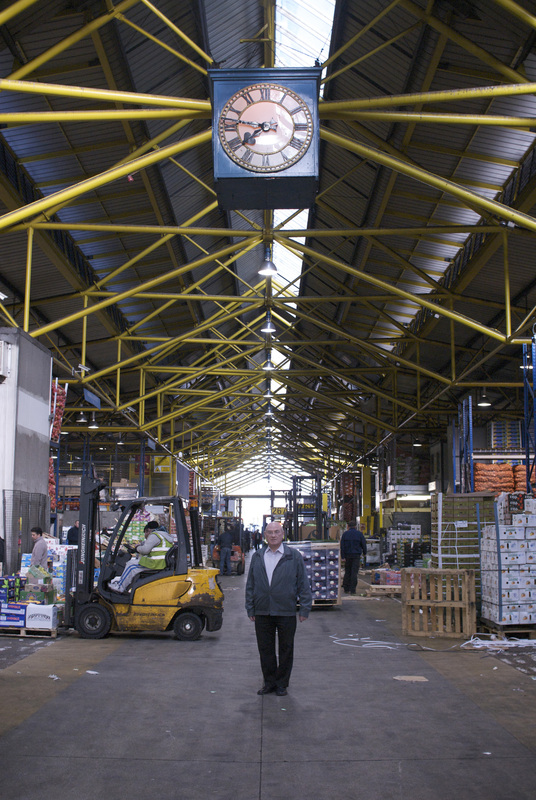 And, although in recent years supermarkets have taken 80% of the fruit and vegetable trade, New Spitalfields Market has been re-invigorated by new traders of diverse ethnicities who now make up 60% of the tenants. In this microcosm of the world, fruit and vegetables from every corner of the globe are traded by European, Asian, Afro-Caribbean, Turkish, Chinese and Egyptian traders (among others), creating a marketplace of Babel. A dignified Hasidic Jewish gentleman passed me clutching a Horseradish root in one hand while his behatted colleague proudly carried a box of fine pink Pomegranates, in preparation for Passover, and reminding me how essential fruit and vegetables are to the cultural vocabulary of almost every people. It filled me with a vertiginous sense of wonder to be at this turning point of the world, where so much produce passes through, coming from farmers on its journey to the people who will eat it. After breakfast in the Floral cafe, Jim and I retreated to the peace of his office which was empty of people by nine in the morning after the night’s work. He explained that Spitalfields Market was created by a royal charter in 1682 signed by Charles II, which meant that only Parliament could alter the charter when the move was proposed, and so Jim spent two and half years in Westminster seeking the approval of both the House of Commons and House of Lords on behalf of the traders. Jim is a phlegmatic yet good-humoured man with whom it is very pleasant to spend time. He seemed remarkably placid for someone who has spent his life bringing conflicting parties to agreement and managing the move of the market that caused plenty of controversy in its time. In these last days now before his retirement, I was touched to sit alone with him as he explained modestly that it all happened because he failed his eye test for the Merchant Navy. Instead he found himself working as Secretary to the Traders’ Federation at the old Covent Garden Market and then in 1974, when that moved to Vauxhall, he had the opportunity to travel around Britain visiting all the regional markets. These visits and the sense of markets as communities of people that he experienced on these trips, touched Jim in some way, because at this point in his story he changed his tone and turned to me, realising what he really wanted to say. Once upon a time the small streets of Spitalfields were crammed with articulated lorries every night and on the restricted site there, the market could never have held its own against the supermarkets. It was the move achieved under Jim’s brave stewardship which permitted expansion and ensured its survival. 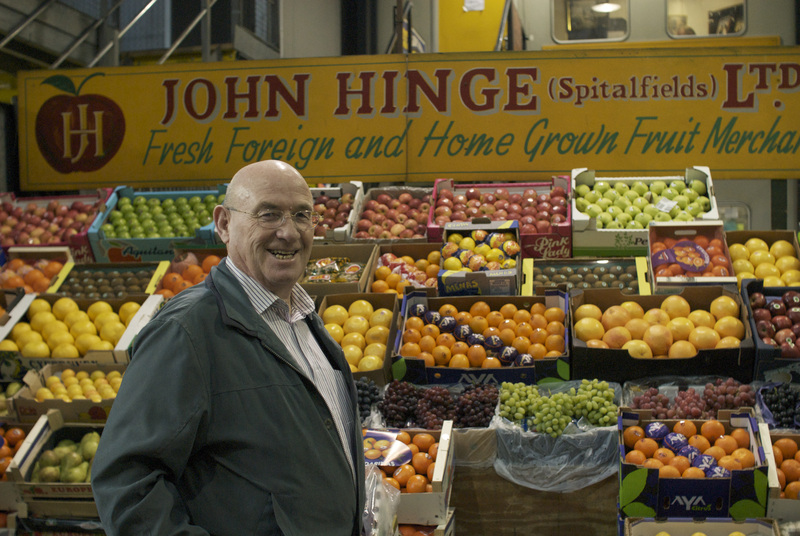 We have learnt to despise the marketplace as an image of the world, but Jim changed my mind because in contrast to the corporate dominance of the supermarket, the New Spitalfields Market thrives as a collective enterprise of traders which exists supplying smaller independent businesses. Over coming weeks, I am planning some return visits to interview the proprietors of the oldest family businesses here and learn their stories, now I have found my way from Old Spitalfields to New Spitalfields. I love the continuity of a shared community history that enable such a phrase: “as I was introduced to men who were six generation fruit and vegetable sellers.” And yet I also love the image of an ethnically diverse market with traders and goods from around the world. Maybe what I love best, is that the two coexist in your neighborhood and you write about it.